rsslounge is an open source, full-featured & web-based RSS feed reader application that is built with PHP-MySQL. It allows you to read your feeds, categorize or filter them, set priorities & more from an Ajax-based slick interface. Besides the standard feed items, rsslounge supports images & photoblogs. For periodically fetching content from feeds, it offers 2 options: cron job or Ajax-based requests (that work while the application is running). Identification the color code of an object on the screen is usually an involved, multistep process: You press the Print Screen key to copy a screenshot to the clipboard, load a graphics-editing program, create a new file, paste the screenshot from the clipboard, zoom in on the object, use the “Pick Color” tool, and finally copy the HTML code of the color to the clipboard. Get rid of this tedious process with Instant Eyedropper – A Free Software for webmasters. 5pm is an intuitive web-based project management tool. Though it packs a lot of powerful features, its interface is very straight forward and easy to use – everything is within a click or two. You will not need to spent time training your team or clients to use it. IntraMessenger is a free application for that enables communication between communities, groups, companies or simply closed groups. It consists of a client (for Windows) & a PHP-MySQL-based open source server to manage the whole communication. The messenger is autonomous, but authentication (login + password) is possible from other existing databases like forums, groupware applications, e-learning systems, etc. IntraMessenger has a multilingual interface & it is a handy application for enabling web-based communities to communicate in the desktop. Glasscubes brings together a collection of online collaboration tools which facilitate better team working and improved communication. It will help you to replace email or existing methods of collaborating by using their online collaboration tools that simply enable users to improve how they work together. 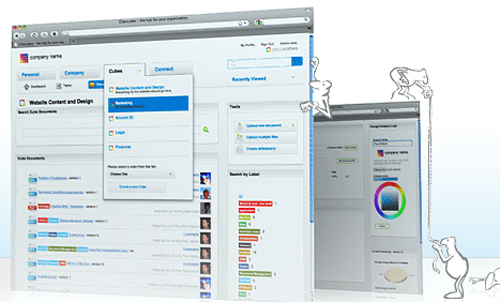 Glasscubes is perfect for small/medium size organizations, teams and people organizing projects. Glasscubes takes project management online and using a combination of features and tools addresses the key challenges faced by project managers. Their version control feature is perfect if you need to work from the latest version of a document, and need to find it quickly. Rather than having multiple versions scattered across multiple computers and email addresses, keep them stored in one place – and always keep the latest version available. You can then comment – sending notifications at any stage.